Form DS-3053 is required when one parent or guardian who does not have sole legal custody applies for a minor's passport since the general rule requires the signature of both parents. The non-applying parent or guardian must complete the form and have it notarized in order to provide consent for the applying parent or guardian to obtain the passport. When written consent cannot be obtained, the applying parent or guardian must complete the special circumstances section of the form. Note, the approval of special circumstance is at the discretion of official passport agents. The instructions are pretty straight-forward and easy to understand. There are three steps to the process. Applicants should use black ink to complete Form DS-3053. Information provided on this form should be complete and correct. Errors on the application or illegible writing can lead to delays in the process. If you are the non-applying parent or guardian who is consenting to the issuance of a passport for your minor child, you should complete item 4. Complete the part but it must be signed in front of a notary public. Click the link to open the form in PDF format: Form DS-3053: Statement of Consent or Special Circumstance for Minor Passport (PDF). 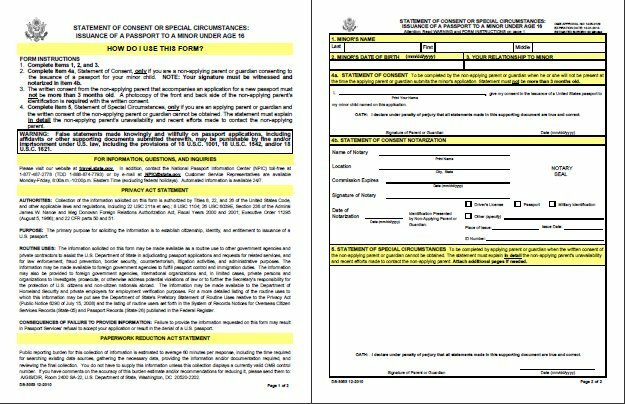 In all cases, Form DS-3053 must be submitted along with Form DS-11: Application for a New U.S. Passport and required supporting documents at an application acceptance facility or, in cases of urgent travel needs, a regional passport agency. A Statement of Consent from a non-applying parent or guardian must be submitted with the minor's passport application within 3 months of the date it was notarized to be valid. A new, notarized Statement of Consent from the non-applying parent will be required for future applications. Answers to frequently asked questions about getting passport for minors. Click here to expedite a minor's passport in 24-48 hours.